RSS is a set of XML feed file formats of varying degrees of use for syndicating time-stamped content from web sites, and sometimes used to refer more broadly to feed file formats as a whole including Atom, or even more broadly in vernacular as a synonym for feed file or even feeds or syndication as a concept. RSS is an acronym that stands for: Rich Site Summary (originally RDF Site Summary, often dubbed Really Simple Syndication). Atom is an alternative XML format for feeds. The most widespread use of RSS feeds may be to distribute information about podcasts. The addition of an enclosure element to the specification for RSS 0.92 passed the web address of an audio file to an aggregator. RSS feeds are the channel through which aggregators such as Apple Podcasts receive information about podcasts. RSS formats are fairly widely used, from news sites to blogs (both self-hosted and services/silos), through e-commerce or classified sites such as Craigslist, though there have been shutdowns in recent years. See feed file for a list of RSS formats and those often lumped in with RSS. IndieWeb Examples Many people use RSS to share content from their websites. Some people feel that other forms of feed are more useful. Use a tool like unmung to convert RSS into h-feed. When using such alternatives, you should consider RSS or Atom's ubiquituous nature. Very few readers support Microformats at this point, compared to the thousands of self-hosted RSS feed readers. Ryan Barrett's granary fetches and converts Facebook, Flickr, Twitter, Instagram, and Google+ data to and from RSS, as well as other formats like ActivityStreams and microformats2 HTML/JSON. Many silos offer RSS feeds for different kinds of content, but the details are not always easy to find. The projects above give access to feeds from some silos. Silo examples offers specific information for several silos. The title is important if there are multiple feeds linked, e.g. category and comment feeds. There are many known problems consuming RSS feeds. See feed#Criticism for an extensive listing. When the GUID for an item in an RSS feed changes, old items that have already been read will appear again as new. 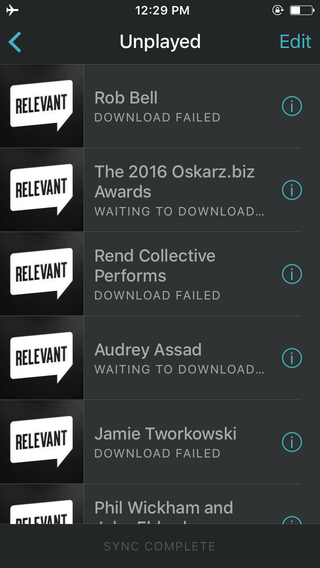 With a podcast feed, this means software will try to download episodes you've already listened to again. gRegor Morrill: I've experienced this several times with podcast feeds. Some of the feeds have 50 episodes in them, so suddenly my podcast software is trying to queue up a lot of episodes I've already heard, and I have to manually remove them. Discussion of RSS in the context of indieweb or openweb etc. typically causes everyone involved in such communication to shift their thinking / conversation to be plumbing-centric (since RSS is a format, not a user feature), instead of user-centric. UX and design are more important than protocols and formats. Solution: refocus the discussion on use-cases. Ask them, "What's the use case you're trying to solve?" Then document the use-case, and how you're solving it with building blocks on your own website. And keep the discussion focused on use-cases, rather than plumbing. RSS variants are all feed files, thus all the feed file criticisms apply as well. This section specifically documents shutdowns or dropping of support for RSS feed files on sites, whether indieweb, corporate, and/or silos. More shutdowns are documented in feed shutdowns. See the Wikipedia article on RSS for a more thorough history. This section is a stub, please add to it to expand it to include notable events in the development of RSS. 2000-12-06 RSS 1.0 was published. "Who is going to tell the normal people that RSS is dead? This page was last edited on 2 April 2019, at 07:38.